John Chan is the Director of the Phoenix Convention Center & Venues and is responsible for the management of one of the premier convention center venues in North America. He oversees a staff of 250 employees with an annual operating budget of $47 million. Under his leadership, the Phoenix Convention Center has hosted some of the largest and most high-profile conventions and special events in the city’s history including the National Rifle Association Annual Meeting & Exhibits, US Greenbuild International Conference & Expo, Veterans of Foreign War National Convention, General Council of the Assemblies of God, Phoenix Comicon and Major League Baseball’s 2011 All-Star Fan Fest. Most recently, Chan was involved in planning and coordinating major events for the city of Phoenix as a host to Major League Baseball’s 2011 All-Star Game, NFL Super Bowl XLIX in 2015, the 2016 College Football Playoff National Championship and the 2017 NCAA Men’s Basketball Final Four. 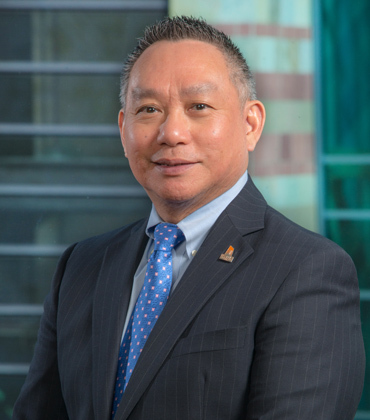 Chan began his career with the City of Phoenix in 1992 and since that time he has held executive management positions in the city’s Downtown Development Office and Community & Economic Development Department. He currently serves on the City Tourism and Hospitality Advisory Board, and is a member of the Greater Phoenix Convention and Visitors Bureau. He was named the 2009 Economic Developer of the Year by the Arizona Association for Economic Development; and under his leadership, the Downtown Development Office received a 2009 DREAMER award for Outstanding Organization from the Downtown Phoenix Partnership. In 2017, he received the Facilities & Destinations ELITE Award for excellence and leadership in the meetings and events industry. Chan is a native of Phoenix and received his Bachelor of Science degree in Business Administration from Arizona State University in 1982.